Tooth Fairy Words - 2 Sizes! Choose your favorite tooth fairy single to create your own tooth fairy pillow. The sky is the limit with this or the other fun singles from Bunnycup Embroidery. This design includes 4x4 and 5x7 sizes. Tooth Pillow - 2 Sizes! 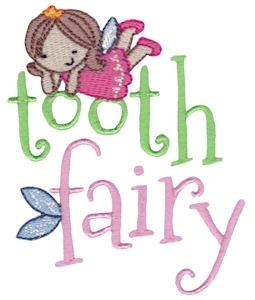 Tooth Girl Applique - 2 Sizes! Finish Size 3.20" x 3.90"
Finish Size 4.79" x 5.84"